Now in Any Colour for Hire. • Our Mime Artists are great for bringing humour to your event. • Our Mime Artists add hundreds of magical comic moments. • Our Mime Artists can create spectacle up close and from afar. • Our Mime Artists blend odd moments to help break the ice. fast paced spectacle, funny nonsense and unusual oddities. The result brings smiles and hilarity to any event. Why not add to the fun! Mime Artists working as a group. increasing the impact and area covered. The Workings of a Mime Artist and Mime Artists. 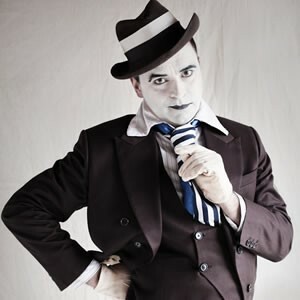 Solo Mime Artist - solo mime is one of the most skilled of entertainment genres. A mime artist has to create interest, excitement, empathy, narrative and humour whilst remaining silent. They constantly discover the ‘moment’ and those moments might be completely different and need different emotions from the last. This sensitivity and awareness are key to being able to perform appropriately and fantastically. The mime artist's greatest skill is being able to do all this and judge it right by finding the appropriate level of engagement with the audience whilst continually generating spectacle, comedy and imaginary plots. Done well it is a captivating experience, fun for all and very rewarding for the mime artist. Group mime - has all the complexities of solo mime with the added issue of working as an ensemble and not as a group of solo mimes. The mime artists need to have a good level of understanding and trust in order to traverse and perform with a unity. What the agents say:- ‘Electric Cabaret never cease to surprise me. they are one of my favourite groups and I try to use them wherever I can. French Mime Artist and other Themed Mime Artists. Theming mime artists is very easy. The most obvious and common is the French Mime Artist theme. French Markets and French Bastille day celebrations. mime robots and many many more more. and we offer a Charlie Chaplin inspired act in homage to the great man. Our Silent Clowns of yesteryear are clown/mime variations who can be themed to specific eras. For example Charlie Chaplin inspired clowns from the silent movie era; gangster clowns from the 1940‘s; silent clowns right up to the present day and contemporary clowns. Check Out More Mime Pictures in the Galleries. Click here. Check Out More Mime Artist Videos in the Galleries. Click here. We have a vest selection on Mime costunes and colours.